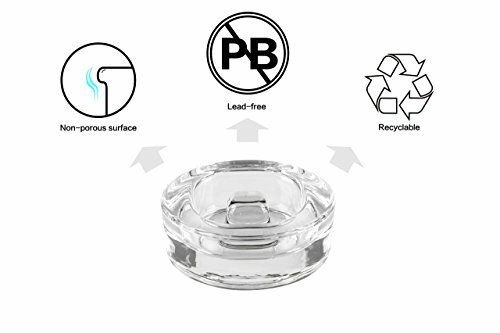 HIGH QUALITY MATERIALS-Our food-safe glass is lead free and non-porous so it never absorbs food odors, flavors, or colors. INNOVATIVE DESIGN-our smart bulge handle design makes it easy to take these weights out of your Mason Jars and offer a much more stable solution than other grooved weights. 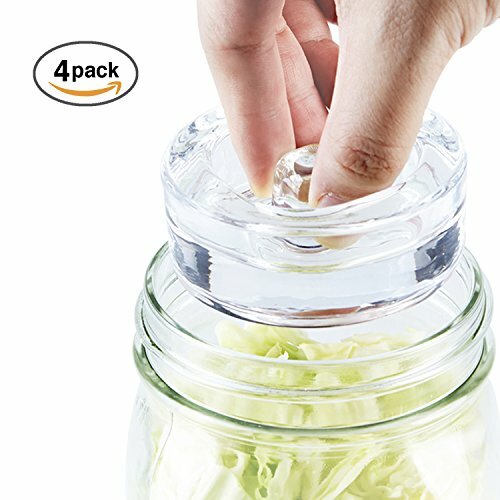 EXCELLENT UNVIERSAL FIT-Fits perfectly with typical wide-mouth Mason Jars, making them just right for small batches of fermented veggies and improving the entire lacto-fermentation process. Why you need a fermentation weight Fermentation is a process of producing bacteria. Some bacteria like mold and yeast that can ruin your ferment always grow and thrive in an aerobic environment that has enough air. So one key point for a successful ferment is keep your veggies under the brine and away from the air. A heavy enough fermenting weight can help you create an anaerobic environment, no more worry about mold. *Our weights are made of high quality borosilicate, which can work excellently even with boiling water. STURDY AND EFFECTIVE–Large and heavy enough to keep vegetables submerged below brine for best results mold prevention-better than DIY weights effective than DIY weights. 100% MONEY BACK GUARANTEE – We will refund your money if you aren’t happy with your weights.